Cordelia and her Cretaceous companions are headed out for a fun day at the beach! They're prepared with sunscreen, a picnic, and lots of beach gear. With the lifeguard watching over, the friends enjoy cannon balls and surprise swimming buddies. Because life's a day at the beach when you have good friends! It's the illustrations. 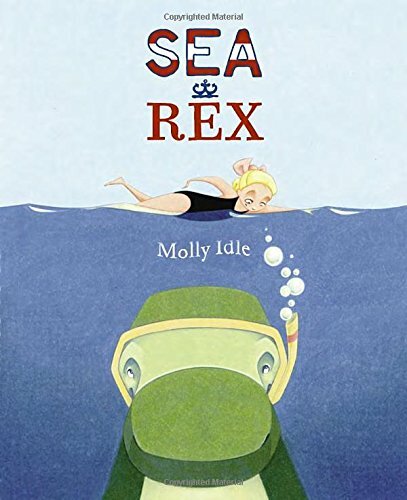 Honestly, Molly Idle is a Caldecott honoree for a reason. The text for this book is cute and educational/informative (though the flow is interrupted with a number of ellipses), but the story is really told through the many different scenes of play at the beach. My favorite favorite detail, by far, is the little boy tan line the T-Rex ends up getting after some sun bathing. It's just darling! Really cute, and I'd recommend it for sure, especially when preparing for a trip to the beach. And I like that it's good for boys and girls alike. As another companion book to Tea Rex, it's obvious readalikes would include Idle's other books. Also, look for other beach books with favorite characters, such as Duck & Goose Go to the Beach and Curious George Goes to the Beach.